Intimations of mortality echo throughout this fifth solo release from the contemplative Los Angeles singer-songwriter, formerly of Uma and Show of Hands. Chris Hickey’s fifth solo album, Love Away, offers a sequence of meditations on impermanence and mortality with an overriding lesson of embracing the journey. “It’s already broken,” he sings on the album’s eighth track, “the glass is already broken”, and this is something about which, with Zen stoicism, we should “breathe a sigh of relief”. Throughout his career, Hickey’s ability to mine the intimacies of our common lives -- the accidental revelation of a glance through a window, the vivid daydream lived in the moments before an opportunity has slipped away -- has connected him to his fan base. He is a storyteller, often in miniature, whose songs, even those most personal, resonate shared experiences via sparse universalities. There is no experience unique to one individual. The complexities of existence are shared. We are all passengers on the same train. A good example is “Hospital”. Despite the song’s first person perspective, the lack of detailed personal signifiers welcomes listeners to insert their own experiences into the framework. This song of loss becomes not simply a document of Hickey’s experience, but an opportunity for listeners to insert and contemplate their own. On the question of who was lost, Hickey leaves the space blank. Listening myself as he sings “You were making plans in the hospital / I didn’t want to go home / You were making sense in the hospital / Now I’m on my own,” I fill in that blank with my own father on his deathbed, who reassured me that all would be well so that I’d leave him to the private business of dying. “Pain is a funny thing to let go of,” Hickey sings in the refrain, and, again, the deliberate lack of a signifier adds depth to the observation: what is the nature of the pain, and who is letting go? The answer could as easily be the subject who is left behind as the patient in the bed, the one who is leaving. “Down the Turmoil”, a duet with longtime collaborator Sally Dworsky, with its repeated refrain of “Lay your weary body down”, revels in an opportunity to “free myself of weight” and to “move to a higher place”. The song’s intimations of mortality are not, though, final or regretful; this is letting go as rebirth, as Wordsworth’s tabula rasa of our initial birth is “but a sleep and a forgetting”. “Eye” amplifies the album’s perspective on the life cycle by featuring Hickey sharing vocals with his own son, Charlie, himself a promising singer/songwriter whose debut EP was released earlier in 2014. Hope permeates this song, with Hickey singing “Look at those children all wrapped up in their causes / No one really ever stops to think about it.” Unlike cultural naysayers, Hickey looks at his children’s generation and their commitments to social justice and finds reason to be optimistic. The repeated vocalization of “Eye” that follows evoke both seeing and being, as Charlie’s shared vocals with Chris initiate a paternal contemplation: The father’s eye views his son, a piece of his own self, now grown into an independent self. They stand together as two “I’s”. Album closer “So Little Time” underlines the theme of impermanence and passages. Hickey sings “So little time / For posturing anymore / Getting closer to the back / Than I am to the front door / Anymore.” A necessary realization for any former angry young man (or woman). Life goes on; we inspire or are inspired. But, we are nonetheless finite beings, and are left with a choice of whether or not to embrace this life, this world, our time. The young act; the old live. The question is what have we learned, and, how does that affect our living? Hickey calls out to his idols past: “Where have you gone Joe Strummer? / God bless you please, Johnny Cash / Where have you gone, Chris Whitley? / God rest you please, Grant McLennan." He’ll join them, someday, as will we all. But as his voice fades, we hear the confidence and acceptance of one who has lived life fully and consciously. Unlike his 2009 release Razzmatazz, a fiercely independent song-a-day experiment, Love Away is highly collaborative, finding Hickey unaccompanied on only its opening cut “Let Me Just Straighten Up a Few Things”. The rest feature an array of musicians who flesh out Hickey’s sparse arrangements without, thanks to producer Walter Zooi, ever crowding his vision. Longtime Joe Henry collaborators Jennifer Condos and Jay Bellerose add a galloping momentum to “Waltzing to Clinging to You” and, when joined by Derde Verde guitarist Dylan McKenzie on “Hospital”, match Hickey’s vocal passion with equally loud intensity. Allison Chesley’s cello adds resonant depth to “Maya’s Day Off” and “Same Train”. Former Mountain Goats collaborator Rachel Ware Zooi and Australian songwriter Anne McCue contribute backing vocals. 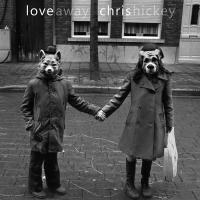 Love Away demonstrates Hickey’s mastery of the song form, one developed over nearly 30 years. First appearing with L.A.’s short-lived The Spoilers, Hickey self-released his first two solo records, Frames of Mind, Boundaries of Time and Looking for Anything in the middle '80s. These generated college radio buzz, and his next project, Show of Hands, a neo- Peter, Paul & Mary collaboration with Randall Kirsch and LuAnn Olsen, caught the attention of Tracy Chapman producer David Kershenbaum and resulted in an eponymous album released by I.R.S. Records in 1988. Disagreements within the band over corporate sponsorship left a follow-up album on the shelf (finally released as Secondly in 2013). Hickey’s louder folk-rock collaboration with Sally Dworsky and Andy Kammen, Uma, toured throughout the middle '90s and released the excellent Fare Well on R.E.M. producer Don Gehman’s MCA subsidiary Refuge in 1997. The new millennium has seen Release, Razzmatazz, and now, Love Away quietly appearing via Work-fire Recordings.